I was in downtown Vancouver today, around Main and Hastings. I was stuck in the left lane behind someone who decided to turn left at the last minute (that REALLY burns me - "Oh, let me see how many people I can pile up behind me, then I'll turn my left signal on" - ). Yes, it was the happy bus. 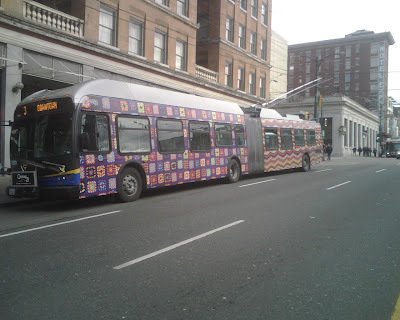 I've never seen this patchwork transit monster before, but it sure made my day. Seeing as I was waiting anyway, I decided to take a picture. Now I'm smiling all over again. I forgot about my stew and decided to throw it out.